So you’ve probably heard it said that Martin Luther was an Augustinian monk at some point in the last few days. Except from me! My own academic pedantry prevents it. And you may even have heard it from Luther himself, who seems at some point to have used the German equivalent of the word ‘monkery’ to refer his activities as a member of a religious order. This is, of course, a matter of terminology, but precision in these matters can help us see the diversity within medieval Latin Christian religious life. Like the Dominicans and Franciscans, Martin Luther’s Augustinians are friars. I thought they were canons, but they weren’t. There are Augustinian canons, though, so we’ll get into them first. As early as the Carolingian Renaissance/Reforms of the late 700s, there were two main visions of the consecrated, religious life in western Europe. One was that of monks —monachi in Latin — and the other was that of the canons — canonici. Monks live in monasteries or priories, closed off from the world. Their main duties, historically, are to pray and to engage in work that will keep them alive, like gardening, and, according to the Rule of Benedict, to read the Bible and meditate on it. By the end of the Carolingian Reforms, the Rule of Benedict was the ascendant monastic rule of western Europe and England. Canons, on the other hand, are a different kettle of fish. Canons are clerics who live together in community but, like the secular clergy (those who do not live according to a rule), they have duties beyond their own community’s enclosures. They are meant to engage in acts of mercy, in preaching, and in public liturgy. In the High Middle Ages, the ascendancy for canons was gained by the Rule of St Augustine. There are a few versions of this document, and they all seem to descend from two different things St Augustine of Hippo (d. 430) produced. For canons, then, the vita religiosa, the religious life, was ordered according a fairly brief set of rules, intentionally flexible to allow them to engage in their duties beyond their community’s enclosures. St Augustine developed his rule explicitly for priests to live in community together, so it makes sense that canons would adopt and adapt it for their local situations. At some point, there emerged a religious order of Augustinians. Any Luther scholars out there can correct me if I’m wrong, but I imagine that he was a member of the order. You may think, ‘Was there no order of Augustinians in the 700s?’ No — there was not even an Order of St Benedict. The first order as such was the Cistercians, although the Cluniacs experimented in widespread centralisation. An order means that all the members and member houses of a particular group of people living according to a rule have a central administration and are ordered by constitutions. There are monasteries, canonries, or friaries that watch over their sister and daughter houses, as well as administrators over regions who make sure that the different religious houses are not falling into various abuses. The heads of the major houses and regions will meet to deal with the business of the order at prescribed times. They are bound together in a mutual society of give-and-take, regulation, and, in theory, fraternal love. In the eleventh century, there arose a number of movements for the reform of the religious life. These coalesced monastically in the Cistercians in the next century and, at a much higher pitch, the Carthusians who are technically hermits who live in community. The living paradox of the monastic ideal. Various groups of canons were also being founded and organised during the eleventh and twelfth centuries, usually, even if they began with their own charismatic leaders, finding themselves under the Rule of St Augustine in the long run. In the thirteenth century we see the rise of the friars. Friars are most associated with the Franciscans and Dominicans, two preaching orders committed to poverty, preaching, and cities. They are mendicant, which means that they are meant to beg for survival, and not live off rich benefices the way many medieval monasteries did. During the rise of the friars, the hermits were also doing their thing in Italy, and were inspired to move into the cities to be able to pursue the contemplative life and to engage in acts of mercy. Those who were granted recognition by the papacy adopted the Rule of St Augustine, and they eventually coalesced and organised into a mendicant order of friars alongside the Franciscans and Dominicans. Thus, by the middle of the 1200s, we have three major forms of ‘religious’ life in western Europe. We have the monks proper, the canons (usually Augustinians), and the friars. There were also, of course, hermits and anchorites, but just monks, canons, and friars will always be few, so hermits and anchorites will always be fewer. All of these groups sought to lead lives of poverty and chastity, of prayer and asceticism, pursuing holiness according their respective rules in community. The problem that rears its head throughout the history of Christian asceticism is the idea that the asceticism or the penance is actually what saves you. This is the chief temptation of the rigorous righteous. Cassian fights it. Benedict fights it. Evagrius fights it. Augustine fights it. Again and again, monks, friars, and canons need to be reminded that they are not saved by their ‘monkery’, as Luther called it. And I would argue that the time for reading set aside in the Rule of Benedict and the amount of study Augustinians like Luther did ought to have helped balance them out, for it is rich in the tradition of asceticism, this battle against trusting in the asceticism itself rather than God himself. But, alas, it is too easy to trust our own works than simply rest in the grace of God, isn’t it? 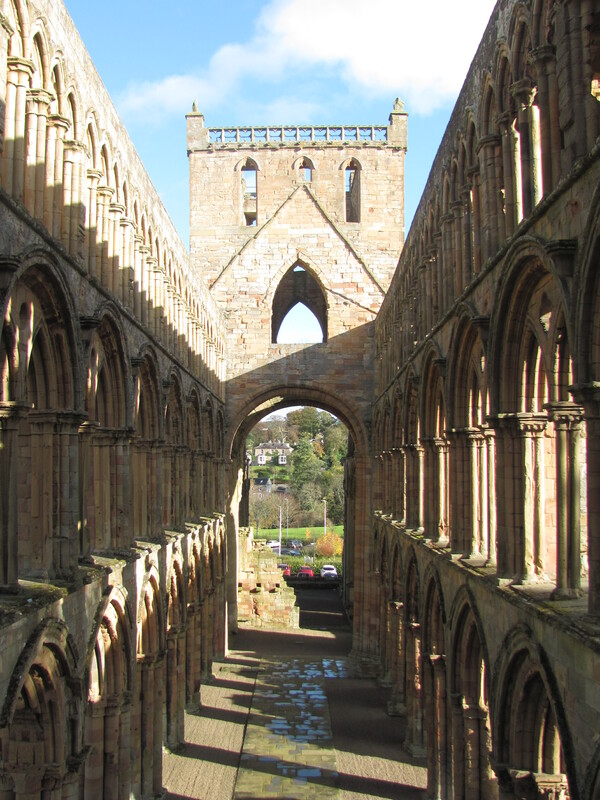 This past Saturday, my wife and I rented a car with friends and fulfilled a desire we’d had almost since we arrived — we visited Jedburgh and Melrose Abbeys. Also, I drove on the left and succeeded in killing no one. Accident free. That alone made it a success. 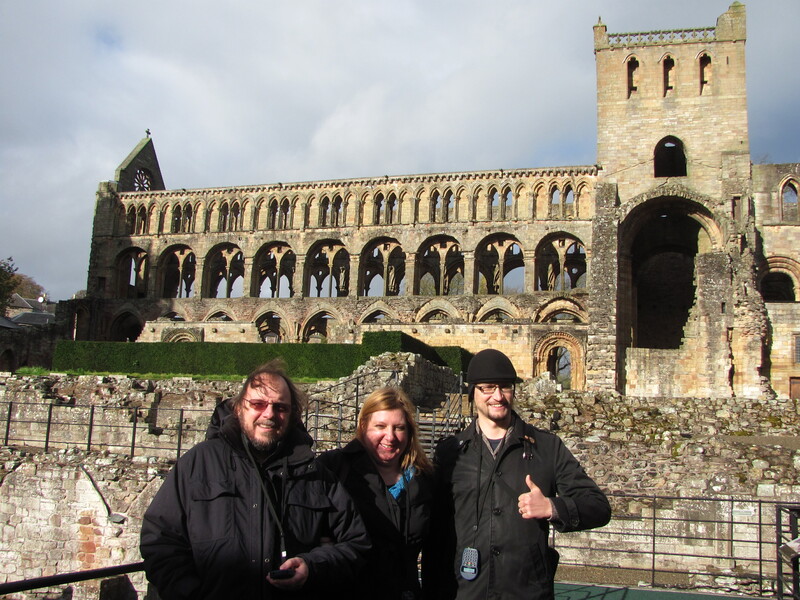 Of course, as this picture demonstrates, Jedburgh Abbey is one of those interesting places that is not a single architectural style. It has some Romanesque and some Gothic aspects. 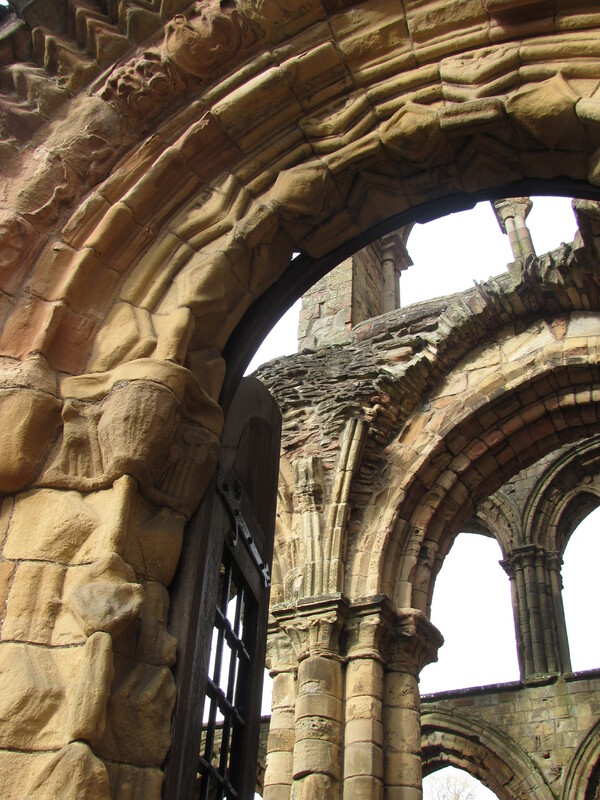 It was begun in 1138 under the patronage of Scotland’s great abbey builder, King David I (son of Queen St Margaret and Malcolm III [‘Canmore’], yes, of Macbeth fame) as an Augustinian Priory. 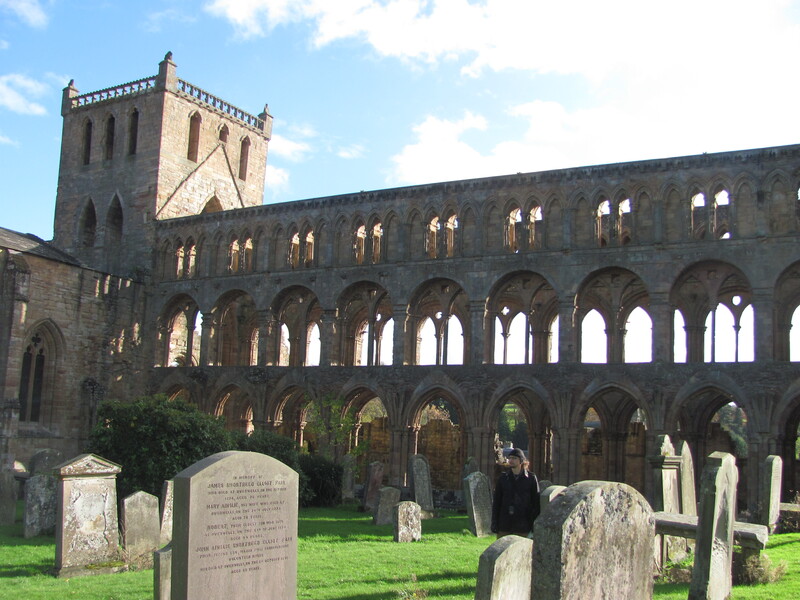 By 1154, Jedburgh’s religious house was large enough to qualify as an abbey. 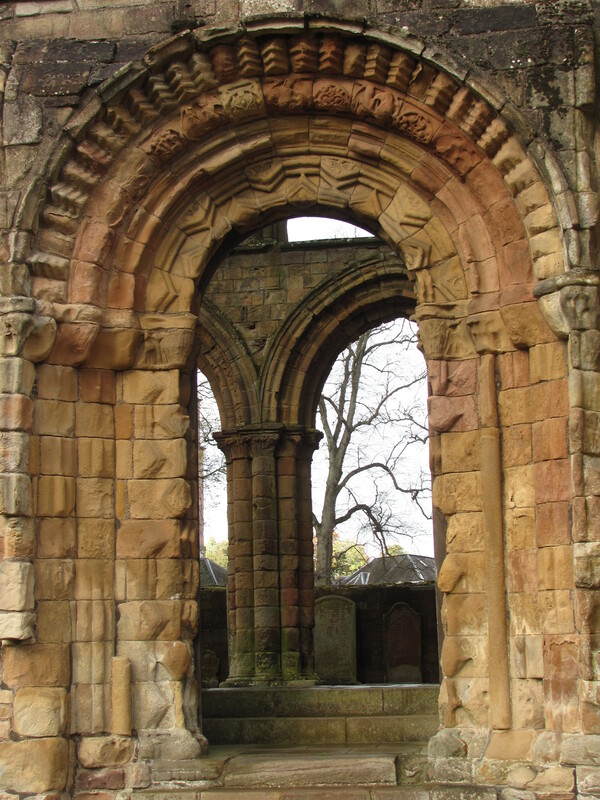 Augustinians — who also had abbeys at Holyrood near Edinburgh Castle and Cambuskenneth near Stirling, places that, like Jedburgh, had royal castles — were not like the Benedictines (first in Scotland at Dunfermline in 1070 under Margaret & Malcolm) or the reformed orders that followed Benedict such as the Cistercians (first in Scotland at Melrose, also founded by David I) or Tironensians (first reformed order in Scotland Britain at Selkirk, later moved to Kelso, also founded by David I, also at Arbroath). Technically, you see, Augustinians are canons not monks like Benedictines and the reformed orders (who follow the Rule of Benedict as well). Monks are meant to live in seclusion, away from the world, devoting their lives to simplicity and prayer. Augustinian canons, on the other hand, are all priests, and they take on responsibilities in local parishes. They, too, are meant to lead simple lives, but they combine the ministries of pastoring and prayer in a way that traditional monks do not. 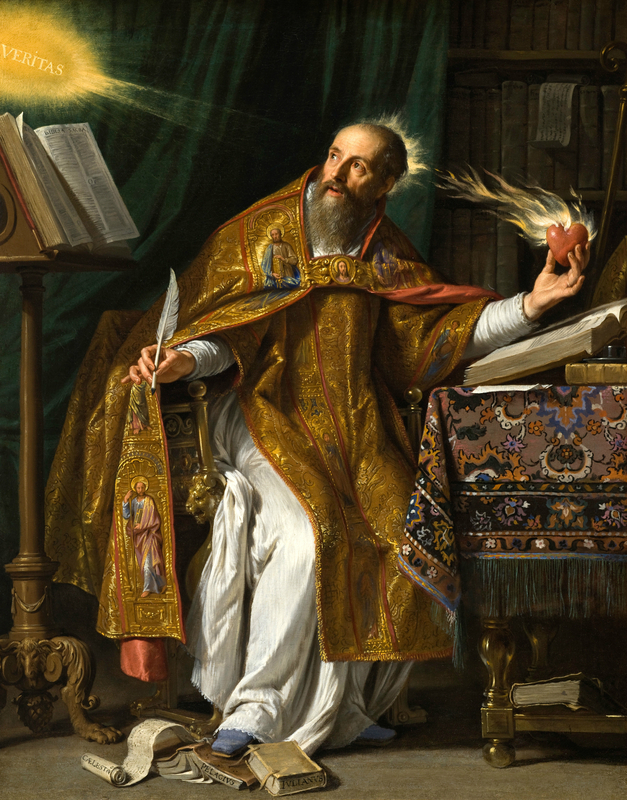 * They follow the Rule of St Augustine of Hippo, which was designed for parish clergy in the 4th-5th centuries; as an order, they were established in 1059. Sadly, this abbey did not have an easy time of it. 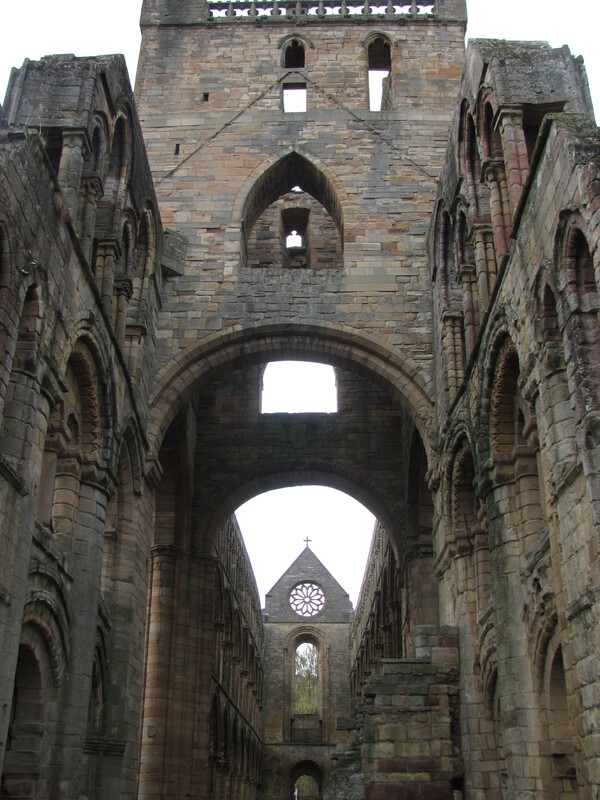 King David built it in the Borders, and he built it big and beautiful, specifically as a way of showing the authority and power of the King of Scots. Later centuries would see that power and authority challenged and hammered. 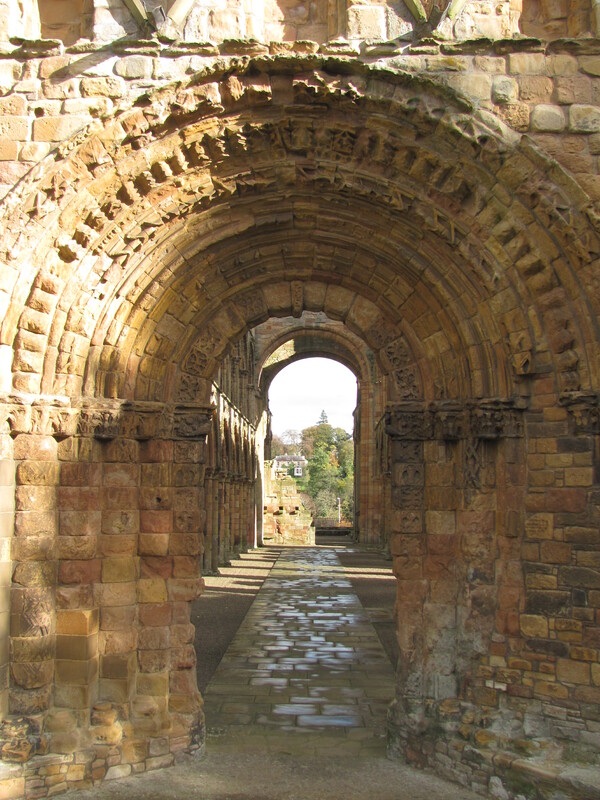 The abbey was besieged and taken by the English on many occasions; Edward I even installed his own abbot. It had to be repaired extensively in the 1400s, and in 1523, the Earl of Surrey, who had earlier slain King James IV at Flodden, set fire to the abbey. 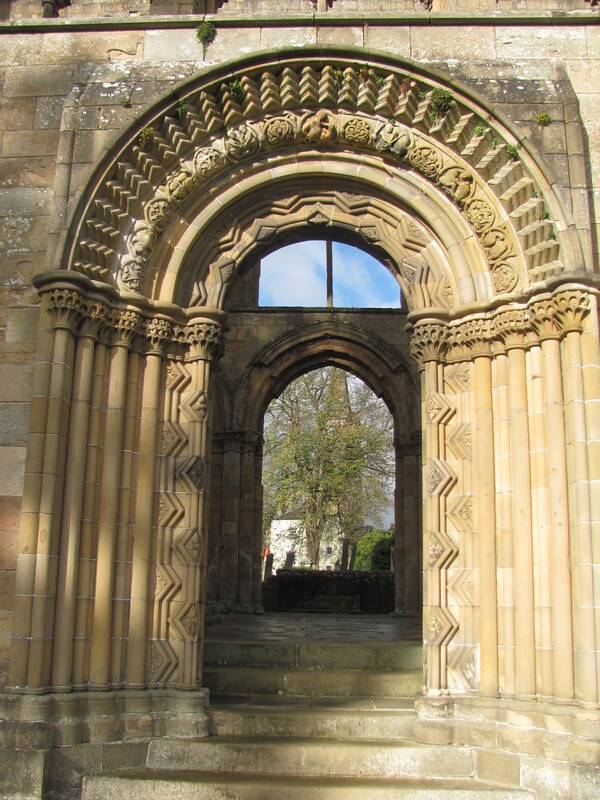 By the 1540s, only eight canons remained at Jedburgh. In the 1560s it was converted into the local parish kirk, and operated in such a fashion until 1876. Next up: Melrose Abbey. Then maybe some reflections on Augustinians and Cistercians. *Mind you, the Benedictine monks I stayed with in Austria were involved in a lot of parish ministry, but that is not Benedict’s ideal.